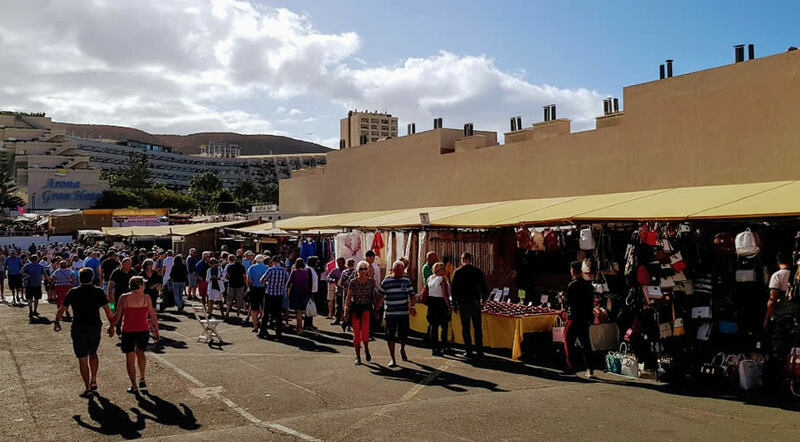 Los Cristianos market is the largest market in the south of Tenerife and here you'll find almost anything you can imagine, from clothes, souvenirs, decorative items, cosmetics and much more. It usually gets very crowded so be careful with your personal belongings. Unfortunately there are a lot of pickpockets around and you shouldn't keep your purse where it can easily be grabbed. Also, you should know that many stalls sell fake goods: from bags, sunglasses, watches and up to clothing items. In case you want to buy this type of things you should definitely haggle before you agree to pay. Most of the sellers have inflated prices and when buying at this market you should always negotiate first. Compared to other similar markets in the Canaries, like Teguise market in Lanzarote, we did not like Los Cristianos market very much. It's very crowded and the stalls are cramped, so it's very difficult to walk around in peace while looking at what's on display. However, the market in Los Cristianos is the most popular in Tenerife South and many visitors seem to enjoy it. If it's your first time in Tenerife, then you should go and look around, maybe you'll find something interesting to buy. Maybe our expectations were too high, but for the most part we did not like it very much because we're not big fans crowded places. If you're staying in the area and you are curious to see what the market it's about, then I recommend you go, even if only for the purpose of buying some souvenirs to take back home. But if you're not staying in Los Cristianos or anywhere nearby, I don't really think this market is worth the trip. You would be better of exploring Los Cristianos and its surroundings. Arrive there early before the crowds. Try to arrive there when it opens if possible. You'll be able to look at the stalls at least 2 times faster, without someone stepping on your tows at each turn. And when you're done shopping and looking around, just sit down at one of the nearby cafes to enjoy a well deserved drink. And if shopping is what you're looking for, then you should read more about shopping in Tenerife.